Congratulations to the Winner of the Speech and Reading Contest !! I hope everyone had enjoyed a relaxing week, and is ready to come back to work. We have four more weeks to go! 1) Passport pick up this Sunday, April 17th. 12 noon. Please be on time. 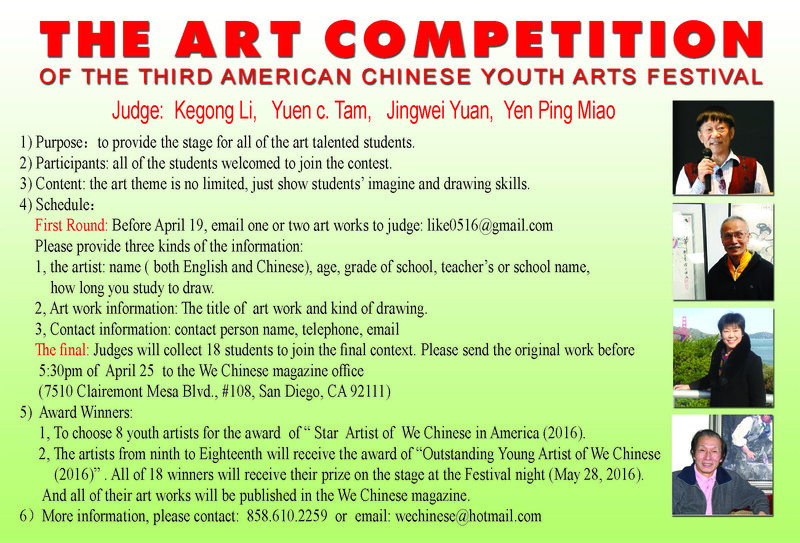 2) The 3rd American Chinese Youth Art Festival is calling on submissions for Art Contest (deadline 4/19). Students, your talent is precious, and there is no better way than present it in the spotlight! Please refer to the attached flyer for details. Ticket for sale: VIP $50, others $15, group (10 +) $10. 3) Credit Program Placement test for current Hua Xia Students is scheduled on 4/24, at 12 noon - 1:15 pm, at I-101A . Students who are entering 7th grade at public schools in year 2016-2017, and wish to take credit class are highly recommended to take the test . (Students who are already in Credit class do NOT need to take the test). For new students to Hua Xia, the placement test is on May 8, same time and location. Requirement for All testers: 1) parent's email and phone number; 2) school name and district in 2016_17; 3) grade level in 2016_17 in your school; 4) for current Hua Xia students, Class ID and Chinese teacher's name . 4) Registration for year 2016-2017. For current students, will begin on 4/17! This year the registration system has been updated to embed a payment portal. All registration and payment must be completed online. Please refer to attached Enrollment Instructions. Current students enjoy a privilege of registration period from 4/24 to 5/22 (end 11:59 on midnight). After that, the system will add a $35 registration fee to all registrations. 5) Room parents meeting this Sunday, 9:30-10:30, or 1:30-2:30 pm, at PTA room (F-212). You will be presented the updated registration system, and understand what you can do to help the transaction. I wish you a great evening. Looking forward to seeing all of our students on Sunday!